A chicken pen, also known as a chicken run, is an enclosed outdoor area where your chickens can enjoy fresh air, sunshine, and a scratch in the dirt, but still be contained and safe from predators. It is typically attached to the chicken coop, or night-time roosting area. Why build a run for your chickens? Having access to the outdoors allows your chickens to express their natural behaviour – socializing, scratching for bugs, picking up grit and rocks for their crop, dust bathing, and generally just stretching their legs and wings. We’re not trying to raise indoorsy battery hens; the whole point of keeping your own chickens is to give them a more natural environment that results in superior quality eggs. A chicken pen doesn’t offer quite the freedom of true free-range, but it provides your chickens with more protection and keeps them where you want them – and not in your garden beds! This is a sensible compromise for a backyard situation. For the heavier breeds of chickens, such as Brahmas, a low wire fence will easily keep them in. If you have lighter breeds that can jump or fly, such as leghorns, you will need a higher fence and possibly even a cover over the top. 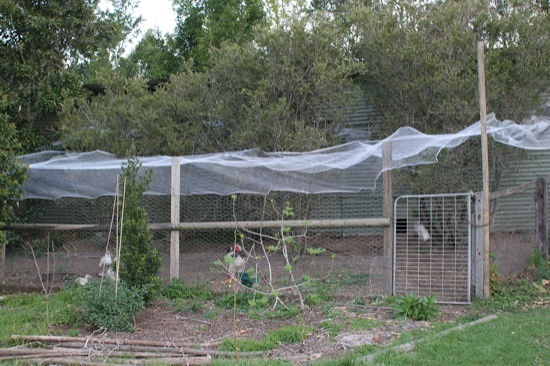 A wire or bird-net cover over the top of the pen will help protect against predators such as hawks and crows, who may attack your chickens, steal baby chicks, and even raid your freshly-laid eggs. It will also keep out wild birds, who will steal the chickens’ feed and can bring in pests such as mites and lice, and disease. If you have digging predators such as foxes, dogs or raccoons in your area, you will also need to secure along the base of your fence. The best way to do this is to dig a trench around the outside of the pen, at least a foot deep, and run the fencing wire down into it. Before starting to build your chicken pen and coop, it is best to check what the local laws and regulations are. Some cities have specific requirements about distances from houses, boundaries, neighbors, food preparation areas, and so on. Some even require that the chicken housing not be visible from the street! A little time spent understanding the requirements now can save a lot of hassle and heartache later. The best location for a chicken pen is adjacent to the coop, so you can let the chickens out directly into the pen each day. The chickens need some sunlight through the day, but you should also make sure they have some shade for protection on hot days. Avoid damp areas as they will quickly become smelly. Although it’s not essential to have your chicken run close to your house, it is beneficial to have easy access to it from the back door without having to walk around gardens or through gates. Having a clear line of sight to your chickens from a commonly-used window will give you joy through the day, as well as allowing you to keep an eye on potential trouble from neighborhood pets or birds. Chicken pens are not hard to build, and needn’t be expensive if you recycle available materials. Take your time, have fun, and you’ll be rewarded with the happiest chickens on the block!